Earlier this month I was interviewed by telephone from Okinawa on Paul Fisher’s weekly Far Side Radio programme which goes out every Wednesday on London’s Resonance 104.4fm. Paul is an old friend with a similar interest in Okinawan music. We have known each other for many years, ever since we first came into contact during the 1990s when we were both living in mainland Japan. Paul is now based in the UK and is involved in many aspects of the music business. He also runs his own website, Far Side Music, which is an online resource for music from East Asian countries. On the show I was asked about my book The Power of Okinawa and I also got to choose some selections of Okinawan music to listen to. I was relieved to find that the phone line seemed to be working well and the eight hour time difference meant that it began at 12 noon in London and at 8 pm here, so it was a very convenient time. I hope the interview is of some interest. 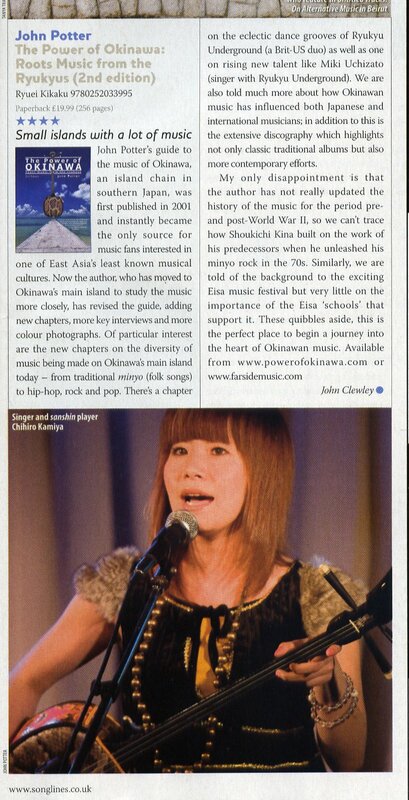 This review of The Power of Okinawa is by Kris Kosaka of The Japan Times newspaper and is reproduced here with permission. An edited version of the review will appear in The Japan Times next Sunday, 3rd October. 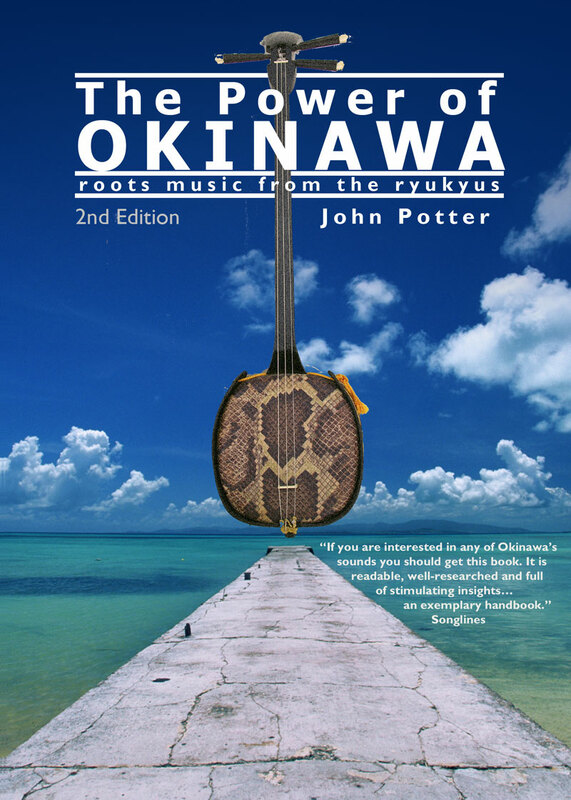 THE POWER OF OKINAWA: Roots Music from the Ryukyus (2nd edition), by John Potter, Ryuei Kikaku, 2010, 255 pp. 2,000 yen (plus tax). A breeze wafts by near the sea shores on the mainland of Japan, and in the gently fading summer heat, you can almost hear the strains of the sanshin, the far island’s traditional instrument. With the recent controversy over Futenma, most of Japan once again turns its gaze towards Okinawa and the rest of the former Ryukyu Kingdom of islands. It is a complicated issue, and many in Japan harbor various misconceptions about Okinawa, including the origins of the sanshin. Take a bit of summer reading with you into autumn, and debunk the myths of Okinawa through its music: pick up The Power of Okinawa by John Potter. Although primarily a chronicle of the roots music from the Ryukyu Kingdom, the first third of the book provides fascinating background to Okinawa, required reading for anyone confused about the islands and its peoples. You learn the origins of the sanshin (not an off-shoot of the Japanese shamisen, as many believe, but evolved from the original Chinese instrument, the sanxian, which the Chinese brought to the Ryukyu Kingdom as early as the 15th century), the many cultural influences active in the Ryukyu Islands (China, Indonesia, Japan, Korea, America – to name a few) and why Okinawa has justification to ask for independence from Japan. (Caught for centuries between the larger powers that surround them geographically, The Ryukyu Kingdom maintained its independence all the way until 1879, when Japan forcibly invaded). In a straightforward, conversational tone, Potter explains the cultural and historical heritage of this island chain, with many anecdotal asides that make for enjoyable reading. Potter does not back down from the controversy. There is an entire chapter devoted to Shoukichi Kina, musical activist and prominent Okinawan politician. From his early success with “Haisai Ojisan”, to his rebellious years and time in an Hawaiian jail to his musical success with Champloose and move into activism, Kina’s story itself pairs well with sun, water, and your own growing awareness of the myriad of influences at work in the Ryukyu Islands. The reference at the end includes recommended CDs and websites to satisfy your burgeoning taste for Okinawan music, books for extended reading, and even live venues in the Ryukyu Islands to consult when planning your next trip. As The Power of Okinawa teaches, “by the end of the seventh century, the Chinese had been searching for several hundred years for the supreme secret – the secret of everlasting life. They believed that somewhere out there in the Eastern Seas was a Land of Happy Immortals…in the year 608, the Chinese finally reached a land which they believed was the place they had been searching for.” Potter surmises the mystical island was Okinawa or the islands just to the north of it. Modern research supports the longevity of the Ryukyu peoples, and perhaps these relaxed peoples, eager to lend a song or friendship, once convinced visiting Chinese envoys they had discovered immortality. You can taste a bit of it yourself, along with a cold one at the shore, by dipping into their music in the waning heat of summer. Last week I received an album by the Basque musician and composer Pello Ramirez. He is an accordion player and cellist and the new album, Eskuz lurrari, is an all-instrumental work which has the feel of a film soundtrack. It was the latest in a long list of album releases sent to me by Anjel Valdes, a record producer and music coordinator at the Elkar label based in Donostia-San Sebastian. Anjel has done great work over the years in recording and promoting a wide range of music from the Basque region of northern Spain and south-west France. The Basques have a long history of music-making and an ancient language unique to them which is unrelated to any other in Europe. It is spoken by around one million people. Like the Uchinaguchi language of the Ryukyu Islands, it is also widely used in the people’s songs and the Basques are rightly proud of their music and culture. The first Basque music I listened to was in the late 1990s when I heard a wonderful track by the trikitixa band Maixa ta Ixia from their debut album Uhinez uhin and was compelled to find out more. Trikitixa is a glorious accordion and tambourine driven mix of pop-folk and this led to my contacting Anjel Valdes who sent me several other releases for review. These included one by the excellent trikitixa duo Alaitz eta Maider who were later able to do a short tour of Japan, playing dates in Tokyo and Osaka. Inevitably, I finally travelled to Spain to meet up again with Alaitz and Maider and other musicians on their home ground in the Basque Country. It is a great shame that the brilliant music made by some of these musicians is not always economically viable and they often struggle to make a living. Meanwhile much of the dross put out by the major record companies enables some lesser talents to live like royalty. 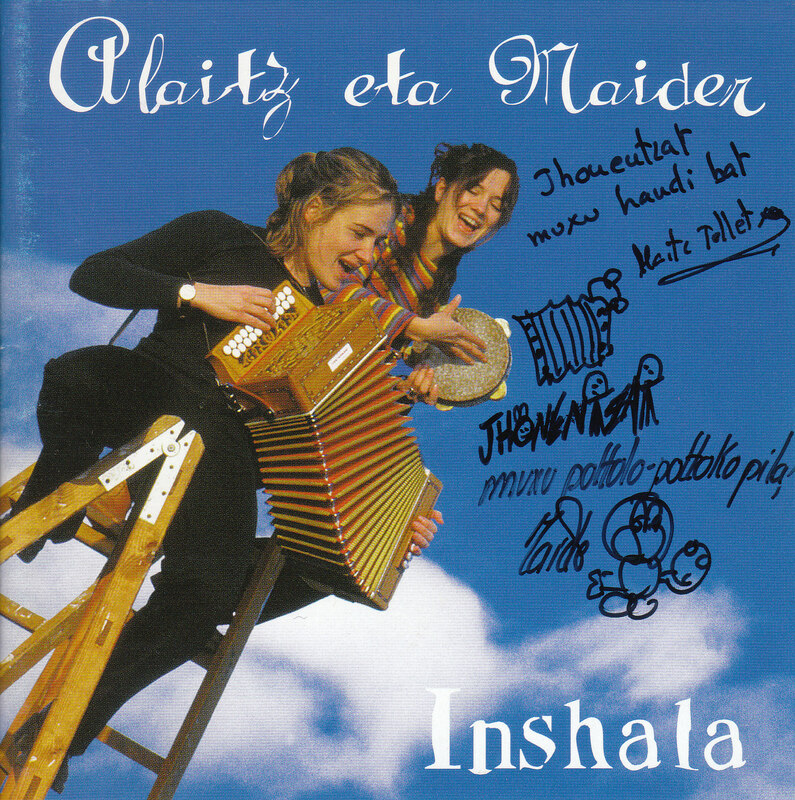 Alaitz eta Maider made three albums but have since split up. Apart from the thrilling and energetic trikitixa style there are many other kinds of Basque music. The accordionist Kepa Junkera has achieved the highest profile outside his own country and is a regular at World Music festivals across Europe. A particular favourite of mine is Benito Lertxundi who has been singing and composing songs since the 1970s and has made many albums. His entire back catalogue was re-released by Elkar a few years ago. If there is such a thing as a Basque Leonard Cohen then it’s Lertxundi and he deserves to be much more widely known outside his native land. Others I’ve regularly listened to are the veteran band Oskorri, the duo Tapia eta Leturia, singer-songwriter Mikel Laboa, young triki-punk band Etzakit, and the singer and harpist Olatz Zugasti. Okinawa and Hawaii have had a strong connection ever since the first immigrants from the Ryukyu Islands arrived in Hawaii in 1900. There is also a Hawaii United Okinawa Association and their home is at the Hawaii Okinawa Center which opened in 1990. The Center stands as a living tribute to the first immigrants from Okinawa who arrived in Hawaii. It was built with donations from Hawaii’s Okinawan and business communities as well as from supporters in Okinawa. I donated a copy of the second edition of my Power of Okinawa book to the cultural center and was naturally very pleased to receive such a nice letter of thanks from the Executive Director of the Hawaii United Okinawa Association, Jane F. Serikaku. Steve Burge is an old friend from the UK. He’s been involved in a variety of musical genres and is currently experimenting with some music projects on his computer. He is also an accomplished poet and all-round good chap. He got in touch with some thoughts after reading the new editon of ‘The Power of Okinawa’. I first met John Potter in London in 1982 and, although he moved to Japan in 1984, we have kept in touch and met up whenever John and Midori were in England. I was particularly pleased to receive the new edition of ‘The Power of Okinawa’, as I know how long John has laboured on this project. The result is a testament to his deep knowledge and an uncompromising attitude to production values. I was particularly interested in the new section on Ryukyu Underground, as their sound has given me a more direct path into Okinawan music. I had in the past struggled to contextualise some of the islands’ music John had sent me. This got me into thinking about the role of indigenous music on the world scene. World Music has emerged as a major force since John first went to Japan, giving rise to hybrids and fusions of practically any style you can think of. But I tend to come back to the simpler idea of a lone musician, singing and playing an instrument as accompaniment. In Ryukyu, voice and sanshin; in the West, guitar or piano. When I saw Kina Shoukichi and Champloose in London I was most moved by a sequence of Kina alone with his sanshin. Central to the idea of a native music is the concept of dwelling, a sense of place and its importance as a home. The philosopher Heidegger coined a word Dasein, or being (t)here, to convey this essentially human feeling. In his words, “Poetically man dwells”. I get this sense strongly from John’s approach to Okinawa and its music. Whether or not the music needs a big star or more exposure to survive, I am glad to see that a younger generation, and new acts like Ryukyu Underground, are helping to keep the dream alive. May the people of Okinawa long enjoy their musical heritage.